Decode DMR with an SDR ! So – you’ve bit the big one and bought a USB SDR – but how to decode some digital then ? I’m no expert, but here’s a brief introduction to getting started SDR’ing – and maybe – just maybe it’ll work for you too. I’ve put a so239 on a short flylead to this RT810T – yes its a digital TV stick, but as i would rather eat hammers than watch TV – a reasonable 50Ω connection was deemed a necessity.. the original MCX connector was totally pointless, but you may have a Belling-Lee – either way, thats exactly 100% better than the sorry little MCX was. When you plug in you USB SDR – Windows will prompt you to install some drivers – don’t bother – you’ll be replacing them in a few minutes anyway. You’ll first need to install the dot net framework here but you probably have it already. 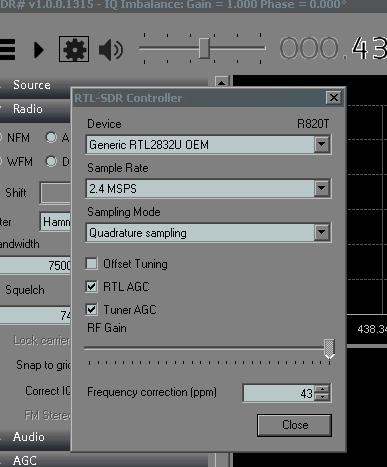 Then you need to download the main software, its called SDR# get it here – there are others.. but i prefer this one. it seems the most popular one anyway. 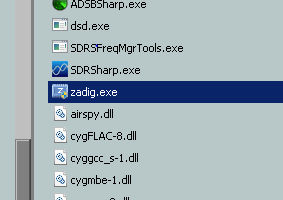 The main SDR setup file will be called sdr-install.zip so you know what you’re looking for in your downloads folder. Then click Install Driver – you can see here that i already have it installed – as in this pic it offers to reinstall – so i didn’t need to. 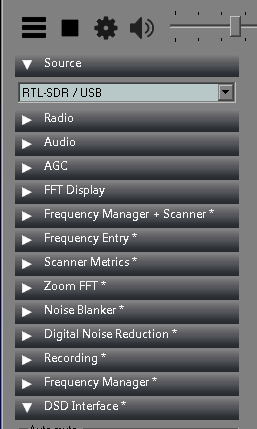 make sure you’re not installing another devices USB driver – i made an error and i lost my mouse – it’s a real pain in the arse trying to navigate Windows with a keyboard..
Now start SDR Sharp – go to the Cog icon – from the drop-down select your SDR – as you can see here – i have a generic RTL2832 dongle. I always slide th RF gain fully up (the slider above where it says Frequency Corerection) and usually enable both AGC’s as these bump up the gain quiite a bit when listening for weak signals. Now lets TEST IT ! The left-hand menu drawer need some tweaking now, oh what joy..
first we need to check its working – unless you’ve selected the wrong Source – it should fire up ok. first thing, lets get it to hear a noise. 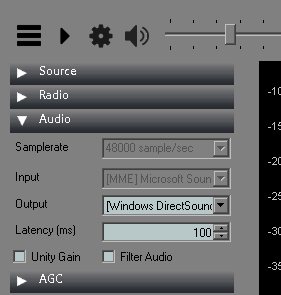 Lets select the output device – here i’m, using Windows direct sound. You might, well ok, almost definately will need to experiment here to find the correct one. Now You have it all working – its time to change it ! download This VB Cable Why ? 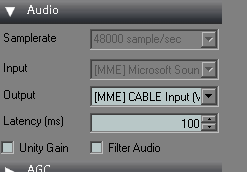 if you’re hoping to decode DMR – or p25 or whatever – SDR sharp doesn’t do it … so you have to get it to pass its audio to another program… this VB cable does that (by the way, turn off any special effects on your soundcard if you have them on too) You will have to reboot after installing VB cable – there’s no interface to the program really – its largely invisible, and as its a very ‘light’ program, which is just as well really, it comes in handy when you’re recording the audio onto the same PC too etc. Now whan you start your SDR – you have a new option -CABLE – for decoding DMR this is where SDR needs to be set, so it can pipe its raw FM audio into a decoder. Welcome to our little corner of the web, and I must say Thankyou for your comments. hopefully, some of the articles here may prove helpful and interesting to anyone who comes across them. Hopefully as time goes on, other members will submit articles and reviews for inclusion on the site too. Thanks for the nice comment Colin, i am sure our chief editor Hax will appreciate it. Hopefully will not be to long before a repeater springs up that you can hit. Got a suitable Dongle, it’s now doing it’s thing via ‘Sharp’, DSDPlus and the virtual cable, but I’m still playing about with ‘Settings’, within the program and without. Useful article, but it’s certainly had me scratching my head for a couple of days. Now I’m looking forward to you getting that Repeater ‘on-air’. V.B .R. and 73 – Derek. (G4ZJL). Grest news ! – Well you might not have long to wait Derek – as GB7MB seems to be NOV ready now – just awaiting confirmation. Well Done – Rock and Roll !